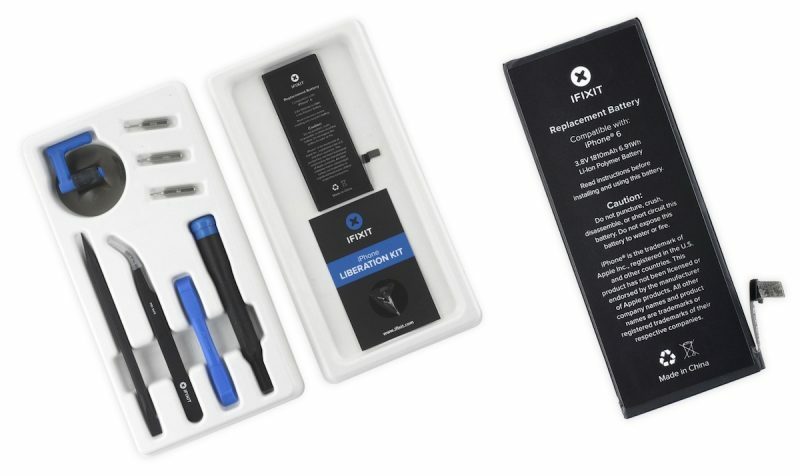 iFixit today announced that its do-it-yourself iPhone battery replacement kits will remain $29.99 until the end of 2019. The repair website lowered the price of its kits in late 2017 to match Apple's discounted iPhone battery replacement fee of $29, which ended on December 31, 2018. Apple now charges $49 to replace the battery in the iPhone 6 through iPhone 8 Plus and $69 for the iPhone X and newer outside of warranty. Apple had lowered its battery replacement fee after controversy erupted about a performance management feature it quietly introduced in iOS 10.2.1. The feature, when enabled, has the potential of slowing down older iPhone models with degraded batteries when necessary to prevent unexpected shutdowns. Apple CEO Tim Cook said Apple replaced 11 million iPhones in 2018, up from a usual one to two million per year, according to John Gruber. iFixit's kits include all of the tools necessary to open up an iPhone and swap in a new battery for those willing to give it a try. If the idea of opening up your iPhone sounds uncomfortable to you, it is probably best to stick to the Genius Bar. Note that do-it-yourself iPhone battery replacements can have warranty implications. I used an iFixit battery kit on my mom's dying iPhone 6. Great instructions and high quality tools. For $5 over the price of just the battery and adhesive strips, you can get a pretty solid set of tools that I have used on several repairs, from my pocket knives to my macbook. I can't emphasize this enough: excellent quality parts and tools! Kit price is quite high. You can get a battery for $10 that includes basic tools. Separating the lid is the hardest part so invest in a good iOpener. I have a hard time believing a $10 battery is safe. Batteries and acdc adapters are the most suseptible to seriously dangerous failure if cheaply made. Do not skimp on these. I like iFixit. And I really appreciate they are fighting for better repairability of consumer electronics. Ignoring all the static about $29 being 'too expensive', I've got to say, I really love iFixit. I seriously wonder what I would do without them. Their guides and their custom tools have allowed me to fix and upgrade countless macs. The most interesting part of this to me is Apple is still keeping their battery replacement costs ($49 or $6) lower than they were previously ($79)... does open my eyes a bit to Apple's pricing policies. Wait until you see Apple's price for their repair kit. Oh wait, they don't make one. $29 is a great deal (IMHO) to give your phone new life, but does come with some risk. Even at $69, I wouldn't be too upset, considering Apple is taking on all the risk in that case. Does this kit include the adhesive seal that maintains water resistance around the display? I don’t plan on swimming with my iPhone but would like to maintain my water resistance rating if possible. Best bet would be to contact iFixit directly. I have dealt with them while repairing my sons iP 5. Great customer service and they will know the answer to your question. God bless iFixit. Their service has pumped life into several iDevices over the years. They are a vocal savior in the Right To Repair cause. If not for third party vendors like iFixit, none of us would even be able to have phones older than the iPhone X unless Apple sold you another every two years. Think about it. Is this a typo? Shouldn't it say 11 million batteries? Maybe not. Apple's in-Store repair services are an illusion. The so-called technicians are just diagnosticians. Software guesses the problem for them. They rarely open a device except to inspect for water damage. Logistically, it's more realistic to give you a unit replacement rather than attempt a repair on the premises (Fans think Apple is being generous). I got a genuine Apple battery... Generic batteries may do the job just as well but probably won't be recognised by the battery health app in iOS 12. How did you acquire an OEM battery? Apple refuses to sell them to third parties and customers. The reviews on Cooliggs are very good - 4.5 stars. You think spending more equals better quality but look at where that has gotten Apple recently.